Iraq is the center of the intersection of the three nations "Arab, Iranian and Turkish", and international attention, and cohesion means cohesion of the three Middle East nations, and deconstruction necessarily means redrawing the geopolitics of the region as a whole; its division is forbidden, and its survival is a state of concern is not possible; And for the region as a whole. In just six days, from January 9 to January 15, nine officials met, including US Secretary of State Mike Pompeo, John Lurimer, senior British defense adviser to the Middle East, and Beijing Zangana Iran's Minister of Oil, John Minza, Assistant Secretary-General for NATO Operations, Iranian Foreign Minister Mohammad Javad Zarif, French Foreign Minister Jean-Yves Lourdien, King Abdullah II of Jordan, Australian Defense Minister Christopher Pine, Sharp international connections. There is no doubt that these successive visits by the aforementioned officials to Iraq are due to two primary factors: the recognition by these officials of Iraq's strategic importance in its Arab, regional and international environment, and that Iraq is a central country in the Middle East environment, which is difficult to ignore. The second is closely related to the first work, which paved the way for such visits. It is reflected in the presence of a highly qualified Iraqi political and security team, headed by Barham Salih, President of the Republic of Iraq, Prime Minister Adel Abdul Mahdi, Foreign Minister Mohamed Ali Al-Hakim, Head of the Iraqi National Intelligence Service. And in view of their national role in the restoration of Iraq's political, economic and security, and occupies the position it deserves at the level of Arab and regional and international, so we will highlight in this paper those political and security figures to serve as role models for other political and security figures in Iraq. "I promise you to protect the unity and integrity of Iraq." This was announced by Barham Salih in his performance of the constitutional right as president of the Republic of Iraq. The Iraqi political class and the international community welcomed the election of the Iraqi parliament, Barham Salih, as President of the Republic of Iraq with great welcome. This is a promising beginning for a technocrat who comes from a conciliatory approach. What distinguishes the current president of Iraq from the other political figures in Iraq is his openness and clarity of position. Barham Salih has been influenced by democratic concepts and norms in Western countries. We have tried and trusted her noble goals, trying to convey these concepts to Iraq after 2003. However, the system of sectarian and ethnic quotas has prevented this. In all of his political stations, Barham Saleh remained the most open and reasonable politician in the eyes of all. He was the most liberal and free from the partial quarrels, and the most able to communicate with all the opponents, who are embroiled in sectarian and national rivalries in his country of Iraq. More importantly, in his view, it is the most acceptable and privileged in the political circles and global decision centers, the American and the European. In a short period of time, Barham Saleh restored the movement to the post of President of the Republic. 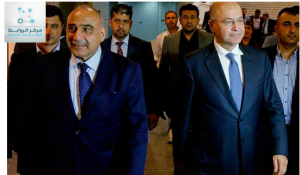 According to Iraqi observers, President Barham Salih may be asked to attend some meetings of the Iraqi cabinet, which Adel Abdul Mahdi is working on. The Iraqi Constitution allows the President of the Republic to share the Government in deliberation on political and sovereign decisions, but does not grant him the right to vote. The Constitution also provides that the executive branch consists of the Government and the Presidency of the Republic. But restricts the president's powers to some formality. In a short period of time, Iraqi President Barham Salih managed to imitate the hopes of many of those who relied on his presence on this site to express their concerns and be part of their solution. The slogan of restoring the status of Iraq in its regional and international environment and restoration of its dilapidated image, which was raised high with the receipt of Barham Saleh for the post of President of the Republic of Iraq in the successor to Fuad Masum, began to materialize with the adoption of the presidential movement dimension of content during the multiplicity of external visits, Arab and regional relations, the latest of which was Qatar and Turkey during this month. His visit comes to emphasize his political convictions: that Iraq seeks to build the best relations with its Arab and Gulf depth and to cooperate with its brothers in establishing good neighborly bases, economic integration and joint cultural advancement, as well as strong ties between Iraq and the Islamic Republic of Iran, We aspire to its development and strengthen its foundations to serve as an example of cooperation for the development and stability of the region. The distinguished relations between Iraq and Turkey also have open horizons for development, thus enhancing the chances of lasting peace that the region and its peoples deserve. However, a person like Barham Salih, with his internal and external political weight, can produce the change that the political scene in the country needs. With his old friend Adel Abdul Mahdi on the top of the cabinet, observers expect Barham Saleh to build an effective partnership with the government. This partnership will face Iraq's myriad challenges, which are compounded by political problems, the large number of local players, popular suffering due to lack of services, the absence of solutions, and the basic infrastructure is badly shattered in the water, electricity and health sectors. Education, roads and communications, lack of resources, lack of resources, rampant corruption, political competition, the reluctance of international companies to invest, and the persistence of security threats in varying proportions, which requires difficult understandings with political partners and international and regional players. Prevent the re-emergence of the "dodgy. Iraq and its friend, Abdul Mahdi, share these concerns. This effective partnership, coupled with the high prudence of Barham Saleh, President of the Republic of Iraq, will make Washington and Tehran friends of Iraq. Political experience and culture do not allow them to take risks in the face of the United States or to turn back to the wishes of the Islamic Republic. They have relations with all parties concerned with the Iraqi issue, both at home and abroad. the election of Barham Saleh as President of the Republic, on 2 October 2018, even commissioned the politician, Adel Abdul Mahdi, to form a new Iraqi government, the successor government of outgoing Prime Minister Haider Abadi. Adel Abdul Mahdi is one of the founding leaders of the "Iraq after 2003", seen as a long-standing figure in Iraqi politics, as an independent figure capable of keeping the middle of the relationship between the internal and external parties present strongly on the Iraqi political scene. Is not an emergency on Iraqi politics. He is the author of prayers and tours that made his name available at every entitlement in Iraq, as a compromise candidate acceptable to all parties. Therefore, this "old" in his hands, much more than he can take on the task entrusted to him. A few months before he was appointed to form the Iraqi government, Iraqi Prime Minister Adel Abdul Mahdi wrote an article in the newspaper al-Adlama, which he oversees and exposes his views on how to build the state, an article with an interesting headline. He pointed out the real danger to any economic and political reform in Iraq, and many may notice the skill of the man in his understanding of these problems and the ability to diagnose them in real terms, these points began to diagnose the problem of rent for the Iraqi economy and what constitutes a barrier to the rest of the sectors of production, The political forces of the economic reform approach to what they are accustomed to the mentality of the state rent as described, and address the issue of separation of powers and the establishment of constitutional institutions, and the problem of administrative corruption, and support the formations of military support, also referred to international relations based on logic, SAS dependency. The observers for the Iraqi issue, Dr. Adel Abdul Mahdi, the presidency of the Council of Ministers with a heavy legacy of the war on the (da'ash), and randomness that accompanied the past period, with scarce resources and the ceiling of project expectations and high, not easy to achieve high success rates ». "What needs to be done is to calm the anger and anger of the street, and to give an energized dose of hope, by providing jobs from the private sector, by offering temptations and exemptions within the available limits. The state is no longer able to absorb the huge numbers of unemployed and the mass of new graduates. " "It requires a minimum of services, and improved through a new vision that does not rely on a mechanism that has not been successful." They pointed out that Adel Abdul Mahdi will focus on defusing internal and regional political tension; that he is a man of dialogue and not a personality clash. And will manage what can be resolved from hot files, and manages what is different in a different way, which creates trust between partners and discards doubts. At the regional level, he needs a calm approach to crises in the region and strained relations with some countries, such as Turkey. And that the Prime Minister-designate needs to develop this harmony between the three presidencies, each of its position, without prejudice to the role of each of them. They expect Abdul-Mahdi to take advantage of the challenges he faces from long political experience, good relations with most of Iraq's political components, and the fact that he is a man of compromise, not a man of confrontations, placing him outside local, regional and international polarization. In addition to having good relations with the most Sunni political forces, Abdul-Mahdi links historical relations with Kurdish politicians; which may contribute to improving the relationship between Baghdad and the Kurdistan region, which was marked by tension during the periods of Maliki and Abbadi, Baghdad can not bear - certainly - its responsibility, After the referendum crisis in the independence of Kurdistan, and the subsequent repercussions, such as the redeployment of the Iraqi army in Kirkuk and the disputed areas (September - October 2017). At the regional level, Adel Abdul Mahdi is a consensual person, as is the case at the domestic level. It was no coincidence that his name was reintroduced to the premiership; it was already put forward during the crisis of 2010, after the victory of the Iraqi List, led by Allawi, ranked first, but Maliki took over as prime minister. However, pushed by Iran, which pressed for the establishment of a broader coalition enabled the latter to form a government . In the context of fierce regional rivalries and conflicts in the region, it is not known that a specific regional party opposes it; it is not calculated on the Iranian line, and at the same time does not pursue policies opposed to Iran. He is also acceptable to the US, though not the US candidate for prime minister. Adel Abdul Mahdi is a statesman who is capable of drawing up a plan to save the country. He has experience in state administration as a finance minister, vice president, oil minister and family descendant with experience in state administration. His father was a communications minister and minister of knowledge during the time of monarchy. Ministers and academic professionals who can succeed. " If Amoura goes to form the ministry in the way that Adel Abdul Mahdi is looking for, it has the political history that allows him to bridge between the sects and ethnicities and the parties belonging to any of these currents, that may help the return of citizenship and belonging to the homeland before belonging to the party and the sect and ethnicity, His academic background and residence in a country rich in his political life, such as France, would allow him to have a modern vision of the concept of homeland and citizenship, and the vision of modern and scientific approaches to the problems before him. Adel Abdul Mahdi is now the most powerful political figure in Iraq because everyone needs to reorganize Iraq and return it to a "normal" situation in which life can resume, or at least delay the resolution of local, regional and international conflicts indefinitely. To that end, Adel Abdul Mahdi will need experienced advisors in political affairs, international relations, culture, economics, finance and services to make the change. But the most important thing to know is that the Iraqi street with him, as was the case with Haider Abadi in 2015, and that he should not accept less than an effective government to restore things to normal, and stop corruption and the provision of basic services and security and jobs and restore Iraq's stability. Adel Abdul Mahdi is the last chance for a prosperous Iraq. Mohammed Ali Al-Hakim has a deep knowledge of the government scene in the Arab world and a strong network of relations. He previously served as Permanent Representative and Ambassador of Iraq to the United Nations in Geneva (2010-2013) and Director of Arab, European and International Organizations and Policy Planning at the Iraqi Foreign Ministry in Baghdad (2006-2010). He was also the Minister of Communications of Iraq (2004-2005), a member of the Foreign Relations Committee of the Iraqi Parliament (2005-2006) and a senior social and economic adviser to the Iraqi Vice President (2004-2010). On 17 March 2017, UN Secretary-General Antonio Guterres appointed Mohamed Ali Al-Hakim as Executive Secretary of ESCWA, the United Nations Economic and Social Commission for Western Asia (ESCWA), based in Beirut, where he is one of the highest-ranking international diplomatic figures in Lebanon. An Iraqi holding such a high-ranking international position and the first Arab in this international post. During his tenure, Iraq participated in the projects of ESCWA, such as achieving sustainable development and achieving the Millennium Development Goals, private sector development, education and women's rights, as well as the development of social institutions in Iraq and the achievement of social justice. And combating administrative and financial corruption. He has a PhD in Engineering and Communications Administration, a Master's Degree in Information Technology and a Bachelor of Education and Statistics. He was able to serve as Iraqi Foreign Minister in the government of Adel Abdul Mahdi. On 24 October last year, the Minister of Foreign Affairs of Iraq, Ali al-Hakim, who knows this minister closely, attests to his vitality, activity and professionalism. This has been reflected in the performance of the Iraqi Foreign Ministry, where he witnessed remarkable diplomatic activity during his meetings with Foreign Ministers of the European and regional countries, in December last, met with Ali al-Hakim with the Minister of Foreign Affairs of Germany and Denmark, and invited them to participate in the reconstruction of Iraq, but this invitation did not live up to some blocks, parties and political forces of Iraq, Devour a regional state Unit reconstruction projects in Iraq, a country that was the cause of -ola Tzal- in the destruction of Iraq. Mohammad Ali al-Hakim, in January, the foreign ministers of Iran and France, as well as meetings with ambassadors accredited to Iraq, including the Turkish ambassador in Baghdad. As for the media uproar that was raised against Mohammed Ali al-Hakim when he stated the belief of Iraq to solve the Palestinian issue through the establishment of two states, and formed a wide debate among the parliamentary circles that called for the accountability and dismissal of the minister. Of course, this media hype. Between 2012 and 2019, a short time space, hardly political positions quickly forget the "sound" !! When one of the opponents today as prime minister of Iraq, held in his era the Arab summit in Baghdad in 2012, and included in the final statement, which called the "Baghdad Declaration," the following: "The Baghdad Summit stressed the need to reach a just solution to the Arab-Israeli conflict on the basis of legitimacy International and the Arab peace initiative, "and at the time did not object to Iraq on this paragraph! , As stated by Iraqi Foreign Minister Muhammad Ali al-Hakim is fully consistent with what Iraq committed to the Baghdad summit. International legitimacy is the resolutions issued by the United Nations with its various organs such as the Security Council and the General Assembly. The Arab initiative launched by Prince Abdullah bin Abdul Aziz, Crown Prince of Saudi Arabia Then at the Beirut summit in 2002, and both the international legitimacy and the Arab initiative called for a two-state solution and Israel's return to the pre-June 4, 1967 borders, as agreed by Iraq, both at the Beirut Summit in 2002 and the Baghdad Summit in 2012. So what is the moral and political value of this uproar? Is of no value, because the source of political calculations utilitarian and not based on political or moral principles, and all political forces in Iraq fully aware of it. To add to that, they may have forgotten or forgotten those parliamentary circles that Iraqi Foreign Minister Mohammed Ali al-Hakim, rather than the foreign minister of a particular regional state or an official spokesman, would declare in a manner consistent with the interests of that country. These parliamentary circles view the post of Minister of Foreign Affairs from the angle of spoils and privileges in complete contrast to the vision of Muhammad Ali al-Hakim. The ministerial post is a national secretariat and a political responsibility that must be fully performed in the interest of Iraq and raised, and paves the way for Iraq to resume its active diplomatic role in its Arab environment Regional and international levels. On June 7, 2016, Mustafa al-Kadhmi became head of the Iraqi national intelligence service instead of Zuhair al-Gharbawi. The former Iraqi prime minister, Haidar al-Abadi, bet on the efficiency of Mustafa al-Kadhmi, his ability to manage the intelligence apparatus, and make fundamental changes in his joints. Abadi succeeded in his bet, and Adel Abdul Mahdi, the current prime minister. Today, al-Kazimi is leading the national intelligence service in the most dangerous stage Iraq security, political, and economic deterioration .. Not only led the helm of the boat, which takes away the sea, facing the strong wind that strikes the legitimacy of each direction .. But he creates, and achieve what has not been achieved before. The most important thing is that he did not surrender on the same path that preceded him on the site. Al-Kadhmi wanted this body to be an effective national apparatus, respected by the Iraqi citizen, not afraid, proud of him, not escaping, supporting him, supporting him and supporting him without being ashamed. Of his support, engage in his ranks, without feeling any preferential advantage, or social exception at the expense of the other citizen .. He fights corruption, does not fall in the wells of the sanctity .. Redeem his life, and sacrifice for the homeland, and is satisfied with this sacrifice, and this redemption . The Iraqi National Intelligence Service, headed by Mustafa al-Kazemi, played a great role in eradicating the terrorist organization in Iraq. The organization was able to thwart the terrorist operations and arrest some of its terrorist elements. Especially the elements that come at the top of the organizational structure. With the qualitative information and the implementation of the International Alliance, this joint cooperation was achieved through an air strike of the international coalition in the hybrid area in eastern Syria on January 20, killing al-Baghdadi deputy (Abu Abdul Rahman al-Tamimi al-Otaibi al-Jazrawi) and killing Abu Saleh Haifa ( Ayad al-Obeidi) deputy Baghdadi, after Abu Ali al-Anbari, and then killed Abu Yahya Iraqi (Iyad Jumaili) Deputy Baghdadi, after Abu Saleh Haifa ». And the arrest of Abu Zeid al-Iraqi (Ismail Alwan al-Ithawi) Chairman of the Commission Commissioner in the organization of Dahesh. The intelligence apparatus, headed by Mustafa Kadhmi, has become highly professional in the field of intelligence and the application of its principles in thwarting terrorist operations and the pursuit of terrorists. These principles include: knowledge as much as need, confidentiality, allegiance, sincerity and obedience, discipline and obedience, And courage. This is what Mustafa Kadhmi has brought to the Iraqi Intelligence Service. The Iraqi National Intelligence Service (NII) has stopped in Iraq's crucial battle against terrorism and in the face of all the challenges and dangers that have beset its experience. The new democracy, and presented a constellation of his sons martyrs in the battle of honor, and continues in the struggle and carrying out his responsibilities in defense of the entity of the Iraqi state and the protection of Iraqis of all spectrums and diversity. The success achieved by the Iraqi National Intelligence Service at the level of fighting an oppressive organization headed by Mustafa al-Kazemi won the respect of all the Arab, regional and international countries. Iraq in fighting this terrorist organization is fighting on behalf of the entire international community. The goal that Mustafa al-Kadhmi wanted to accomplish in his position as head of the Iraqi national intelligence service is to confirm that this sincere apparatus belongs to the unity of Iraq and to all Iraqis, and strengthens the citizens' confidence in it and establishes the relationship of cooperation and cooperation between the body and the citizens. And the balance between maintaining and maintaining the rule of law and maintaining the security and stability of Iraq, and is fully committed to the letter and the spirit of the laws in force, and exercise its powers within the legislative and legal frameworks, and this guarantee assured the commitment of intelligence as a human rights security and support the process of modernization and development and democracy. As a result, we conclude that Iraq desperately needs political and security officials whose ambition is to reach Iraq in the ranks of the democratically developed, economically prosperous, stable, and politically active countries. With Barham Saleh, Adel Abdel Mahdi, Mohamed Ali Hakim and Mustafa Kadhmi, Iraq can reach that goal.